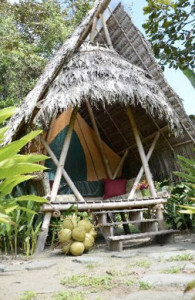 These charming, small, wood and bamboo structures can accommodate 1 – 2 people. Each structure has an 8 x 8 square foot tent on a platform with a covered porch with two soft bench seats for relaxing. The porch is equipped with a light. Here you share your toilet and sink with others in tents (three tents max per toilet and sink). Each tent has its own private shower. The toilet and sink is a short walk from your tent (~15 yards). The platforms were designed to immerse you in the jungle and provide you with privacy. Each tent has two comfortable, twin bed mattresses supplied with fresh cotton linins. All tents have two small (6 inch) fans, and are 100% bug proof. The tent camp is located at Playa Sombrero, close to Playa Matapalo on the Osa Peninsula in Costa Rica.